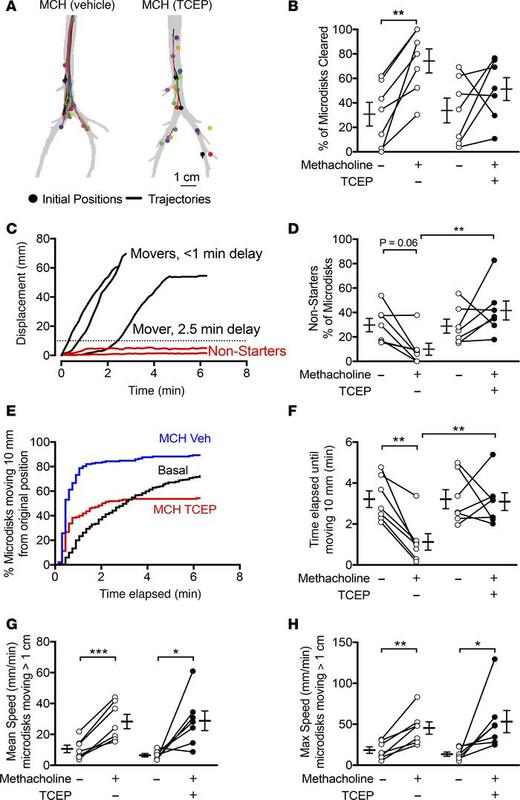 TCEP decreases methacholine-driven initiation of microdisk movement in vivo. In vivo tracking of tantalum microdisks using CT-based assay. (A) Examples showing initial positions and trajectories of microdisks in a pig that received i.v. methacholine and inhaled vehicle and a pig that received i.v. methacholine and inhaled TCEP. (B) Percentage of microdisks that were cleared from the lungs during the 6.3-minute tracking period. (C) Examples show displacement as a function of time of 5 microdisks. Some microdisks moved immediately, and others had a variable delay. Some microdisks never moved past the 10-mm threshold (dotted line) and are marked “non-starters” (red). (D) Percentage of microdisks that are non-starters. Data were obtained under basal conditions or after administration of i.v. methacholine and after aerosolized vehicle (left) or aerosolized TCEP (right). (E) Percentage of microdisks moving >10 mm from original position as a function of time. Data are pooled from 7 experiments, with 178–354 microdisks tracked per condition. Conditions are basal (black), methacholine/vehicle (blue), and methacholine/TCEP (red). (F) Time elapsed before microdisks moved >10 mm from original position. (G and H) Mean and maximum speed of moving microdisks. Each set of data points and connecting lines is from a different pig. Lines and error bars represent mean ± SEM. n = 7 per group. *P < 0.05, **P < 0.01, ***P < 0.001 by 1-way ANOVA with Holm-Sidak’s post hoc multiple comparisons test.